Principally known for his Great Gospel Crusades throughout the continent of Africa, Evangelist Reinhard Bonnke has spent over 50 years pouring out his life so that others may hear the liberating gospel of Jesus Christ. 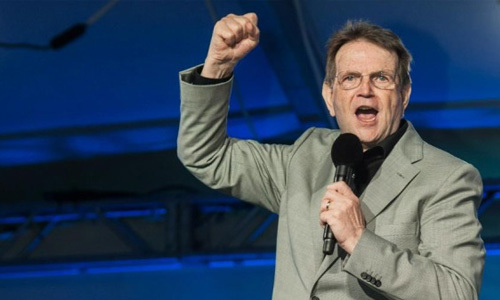 From Cape Town to Cairo, Reinhard Bonnke began holding meetings in a tent that accommodated just 800 people. Attendance steadily increased until in 1984, he commissioned the construction of the world’s largest mobile structure – a tent capable of seating 34,000 people! Soon, his attendance even exceeded that capacity and he began open-air Gospel Campaigns with an initial gathering of over 150,000 people per service! Since then, he has conducted city-wide meetings across the continent with as many as 1,600,000 people attending a single meeting using towering systems that can be heard for miles. It has now been some 35 years since Reinhard Bonnke founded the international ministry of Christ for all Nations (CfaN), which currently has offices in the United States, Canada, Germany, United Kingdom, Nigeria, South Africa, Singapore, Australia and Hong Kong. Since the start of the new millennium, through a host of major events in Africa and other parts of the world, the ministry has recorded 55 million documented decisions for Jesus Christ. As part of the discipleship-training program he instituted, 185 million copies of CfaN follow-up literature have been published in 103 languages and printed in 55 countries. Millions of books have been printed and freely “seeded” in nations around the world. All this is in addition to the Reinhard Bonnke School of Fire, a correspondence self-study course aimed at inspiring others to Holy Spirit evangelism and leading to either a certificate or university credits. Reinhard Bonnke is also recognized for hosting Fire Conferences in many different countries of the world – events that are aimed at equipping church leaders and workers for evangelism; for distributing over 95,500,000 copies of Minus to Plus, a profound salvation message, to homes around the world; and for seeking every opportunity to reach and to save the lost. More recently, Reinhard Bonnke has spent several years developing the Full Flame Film Series, a series of eight inspirational films aimed at challenging the church to Holy Spirit evangelism. He also created a 6-week training course specifically designed to raise up soul winners in the church, and it’s empowering local churches to grow exponentially! With this course, entitled Crash Course, pastors, leaders and students alike are learning and applying proven, effective principles of evangelism that produce growth. All of those participating in this concise, power-packed 6-week study uncover methods and principles of soul-winning, receive a deeper understanding of God’s Word and the function of the Holy Spirit, and grow their confidence in how to witness and take part in evangelistic outreach. As a kick-off to ignite the interest and passion of attendants, Reinhard Bonnke may travel to the local hosting church and share his heart in the afternoon of the Saturday “SWIM”- course, imparting his years of wisdom and faith and then commissioning members for the road ahead. The following five Saturdays of the course are led by local church leadership through guided materials. This method has proven to be a great way to “infect” the body of Christ with the zeal to win souls in their own neighborhoods and communities. If you are looking to set your congregation ablaze with soul-winning fervor, invite in the burning passion of Evangelist Reinhard Bonnke. Contact us today!